Community leaders and a determined team of educators at the school board are trying to help students strengthen their Innu identity through classroom lessons and time spent on the land. Around 20 kilometres into a remote part of the Labradorian interior blanketed by semi-frozen marshland, a dozen Innu women and teens are charging through thick brush in the dark, nearing the end of a 12-plus-hour trek. Just then, walk leader Nympha Byrne makes a misstep. She sinks into icy marsh waters up to her waist. Chenille Rich, 16, the only other walker within eyeshot, jumps into action and pulls Byrne out. She tugs off her boots, peels off her socks and starts a fire. "She saved my life," Byrne said hours later, warm in a cabin surrounded by teens who by then had walked a total of 27 kilometres. For Chenille, and the other young women, this walk is a chance to prove something to themselves, said Mary Jane Edmonds, the walk organizer and a community leader. It's a chance for them to learn how to survive and thrive in Natuashish, a reserve home to around 1,000 people where young people are comfortable and can thrive in their culture, but where they sometimes feel isolated, get caught up in gossip or start drinking or taking drugs; and on the land, their traditional Innu home, where Edmonds teaches them the strength and independence that comes with connection to Innu culture. As Edmonds says, "the land is our culture." The Innu women and girls are following the footsteps of their ancestors, who lived mostly nomadically on land spanning Labrador and Quebec, a region referred to as Nitassinan, following caribou herds, hunting, gathering berries and living in tents. But in the 1960s, under the guidance of the church and the province, the Innu moved onto permanent settlements. That move caused a break from life in nutshimit — as the Innu call time spent at camp in the country — and a disconnection from land and culture, say Innu leaders today. Today, there are two Innu communities in Labrador: Natuashish is a fly-in community on the coast of Labrador and Sheshatshiu is 45 km by road north of Goose Bay. Now Edmonds, community leaders and a determined team of educators at the school board are trying to help students strengthen their Innu identity. Mamu Tshishkutamashtau Innu Education, an Innu-run school board, is just a decade old. "When the community had asked for running their own school, they wanted more Innu in the school system," said Kanani Davis, the school board's director of administration and professional services, reflecting back to years prior when the province ran the Natuashish and Sheshatshiu schools. "They wanted to see more Innu culture, more language taught, make it more Innu-friendly, basically." Before 2009, when the province was still in charge, years went by when no students graduated from high school, Davis said. In just one decade, the board now boasts around 100 graduates, she said. The schools still follow the Newfoundland and Labrador curriculum, but today, there's an emphasis on Innu teachings, Innu language and land-based education. Innu classroom assistants work closely with students to teach them Innu-aimun, the Innu language. Elders are invited to share knowledge with students in tents near the schools, and children aren't marked "absent" when they leave school to spend time out in the country with their families. A new Innu Studies high school course, approved by the province and now taught in Sheshatshiu, is also bringing more cultural lessons into the classroom and answering students' questions about "what it is to be Innu," said teacher Krista Button. Button is a member of NunatuKavut, Labrador's southern Inuit, who grew up across the river from Sheshatshiu in North West River and holds a master's degree in curriculum teaching and learning studies with a focus on Indigenous education. The new course "shows the kids 'you are important. Your culture is important,'" she said. "If you don't know who you are, how are you supposed to find your place in the world?" Leaders such as Natuashish Chief John Nui see student success as intrinsically tied to their knowledge of language and culture. "Once you lose your language, you're losing a very big part of your identity," said Nui. And he sees multi-generational outposts in nutshimit as crucial for maintaining connection with language, culture – and Elders. Elder Elizabeth Penashue, who now lives in Sheshatshiu but grew up in nutshimit, helps facilitate that connection through her walks on the land. "When the kids go nutshimit, big change," she said, sitting on a couch in her home, her hair pulled back in her traditional red headscarf. "They talk nice … they never talk about money, drugs or alcohol." On Penashue's walks, youth talk about the animals they'll hunt, the boughs they'll pick for the tent floor and the fires they'll make, she said. But once they leave nutshimit, problems return, Penashue said. Many in the community worry about the future for youth who spend less and less time on the land. 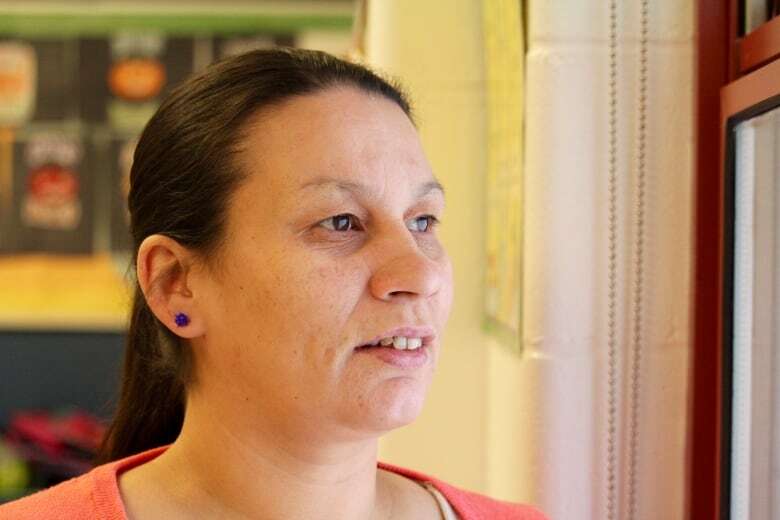 Today, Innu youth are "wanting to be a white person, maybe," said Dawn Marie Rich, a Grade 4 Innu classroom assistant in Natuashish. Rich said many children today are reluctant to eat traditional Innu food like caribou meat, partridge and bannock, all foods they call "gross," while they prefer to eat white bread, chocolate bars and hotdogs. "It's fading out, the culture that we have," she said of life in Natuashish. "That's the saddest part." Her own three-year-old daughter doesn't like speaking Innu, she said. "When we try to say [to her], speak in our language, she cries." Rich's mother, Katie Rich, the Natuashish school's director of education and a former chief, said fewer children are speaking Innu. She calls it an "alarming" trend. But she empathizes. As she sees it, her students have to work twice as hard as the average non-Indigenous Canadian kid. They need to learn Innu language and culture as well as the English language and a western curriculum, she said. The challenges don't damper her high hopes for students. She said she wants her students to become doctors, teachers, psychologists. "It hits me right there," she said, her hand on her chest. "Our kids are the best. And will be the best." Still, the schools face an uphill battle to offer the same standard of education that off-reserve children in Canada receive. Elena Andrew, Sheshatshiu's community director of education, rattles off a list of the school board's challenges: difficulty recruiting dedicated teachers, limited federal funding that has to cover expenses such as around $400 one-way flights from Goose Bay to Natuashish, overworked guidance counsellors and the need for more resource teachers. Reports show government funding for on-reserve students pales in comparison to what non-Indigenous students receive. Andrew added that First Nation communities have the burden of transgenerational trauma due to residential schooling. Teachers have to work extra hard to encourage some children to come to class, she said. "Most parents have not had a good experience in school," Andrew said. "So if you haven't had a good experience at school … you may have issues with school and teachers and administration." Another reality: no Innu teachers at either school. Davis is the only Innu person with a Bachelor of Education in either community, she said. The school board is striving to change that. It has covered the cost for two Sheshatshiu staff and five Natuashish staff to attend a classroom assistant training certificate program at Nipissing University in Ontario in the summer, with the immediate goal of enhancing their teaching abilities and the long-term hope that they will go on to pursue a teaching degree, Davis said. Andrew's long-term goal? Both schools fully staffed by Innu. "You'd have people who know the kids, who know the language, who know the culture, who know the history of the community," she said. "Kids would be seeing themselves in teachers. Right now, the teachers are awesome, they're great, but nobody sees themselves in any of these teachers." While teachers and school leaders want students to obtain diplomas and degrees, they grapple with the trade-off that is required for students to earn those achievements; time in the classroom takes away from time in nutshimit. And it's clear nutshimit is where many students feel happiest. In Natuashish, students' eyes light up when talking about setting snares, cleaning partridge and sleeping in tents. Back on the women's walk, moonlit water and a beach appear. Then a two-storey cabin on the shore. The women and girls let out cheers when the key turns in the cabin's lock, then pile into the cabin, spreading sore limbs on mattresses, plugging phones into chargers and trading stories of past walks. "Which was your hardest?" they ask each other. All walks are hard, says Edmonds. They're supposed to be. "They can do anything if they do this walk," she said days later. "In life, in real life, they can do anything they want and succeed." A few weeks later, several of the girls who participated in the walk won a regional volleyball tournament. Edmonds took to Facebook to congratulate them. "The kids today… have adapted with the evolution and the environment. They have stepped up and are going to be the change in our Innu communities," she wrote. "I'm so proud. I could cry."